The Birmingham Adoption Centre has a whopping 56 volunteers who help us out throughout the year with a range of different things, such as cat care, organising fundraising events, social media and website editing. We’ve always got things to do and so the help of all our volunteers is greatly appreciated. To celebrate Student Volunteering Week, which runs from 11th – 19th February 2019, we caught up with two of our student volunteers, Tash and Charlie, to find out more about their volunteer roles at the centre. Hi both! So, what’s your student volunteer role at the Birmingham Adoption Centre and how long have you been volunteering here? Charlie: I’m a volunteer cat care assistant and I have been volunteering for 8 months in total. Tash: I’m also a volunteer cat care assistant and I began volunteering in September 2018, so have been at the centre for 5 months. What are you studying and what do you hope to achieve in the future? Charlie: I’m studying Animal Management Level 3 Extended Diploma and I hope to have a career in veterinary practise as a veterinary nurse. Tash: I am currently studying a Level 3 Diploma in Animal Management with Science. Once I have completed this course, I aim to go onto higher education to study Veterinary Physiotherapy. What made you decide to become a volunteer with the Cats Protection and how will volunteering help your studies? Charlie: I decided to volunteer at Cats Protection as I love the work that all the staff do to make cats lives as good as possible. Also, all of the values that the organisation has mean a lot to me, as I love cats! Volunteering will help my studies, allowing me to complete 300 hours of work placement experience and will enable me complete my course. Tash: Alongside my college course, I am required to gain 150 hours of work experience a year in order to gain transferable skills and experience to use throughout my college course and in my future career. When looking for a placement I decided that I wanted to volunteer at a charity so that the work I would be doing would make a difference to vulnerable animals. Due to the Cats Protection’s amazing work in protecting and helping cats, I felt this would be a great place to volunteer. What's a typical day at the centre like for you? Charlie: A typical day is great at the centre, I learn so much from being here. I undertake many tasks like helping to clean the cats’ pens, helping out with the vet run (fetching cats) and socialising the cats. All of the staff are quick to give me the support and information I need to complete my tasks, no matter how busy they are. Tash: On arriving to the centre at around 8am I generally wash all of the bowls from the morning feed and any other general housekeeping. At 9am all of the volunteers have a ‘huddle’ meeting with the Volunteer Team Leader, Clara, who tells us any news from the past week and confirms where we will each be cleaning. Following this, I clean out each cat and work my way down the corridor making sure that each pen is set up neatly and suitably for the cats. Once the cleaning is finished, I often help check in new cats to the centre, which is very interesting and provides a ‘behind the scenes’ insight into how cats are rescued. During this time, I am also allowed to watch flea and worm treatments and sometimes even microchipping. In the afternoons I often deep clean the pens of the cats which are ready for homing, or interact with some of the cats in the centre. Now, a very important question indeed! Who is your favourite cat at the moment and why? Charlie: My favourite cat is probably Toby because he is so loving and always greets you with a big head bump and is constantly purring! Tash: My favourite cat at the moment is a beautiful ginger and white boy called Tigger. 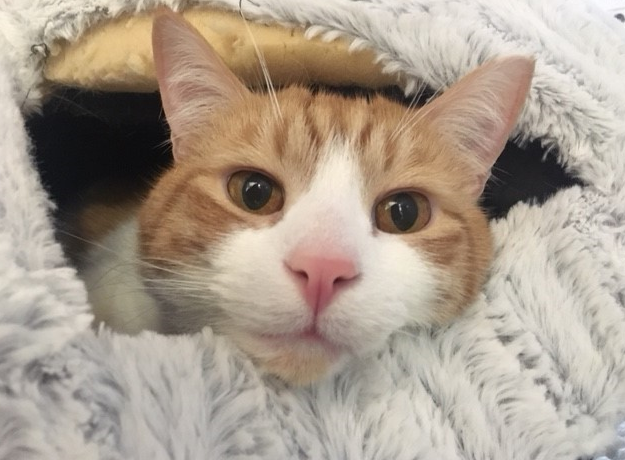 This is due to the fact that Tigger is quite a nervous cat, however when given love and attention, he comes out of his shell and loves to be fussed. I feel that interacting with more difficult cats like Tigger is extremely rewarding! What’s one thing that you've learnt about cats that you didn't know before? Charlie: I’ve learnt that female cats can have multiple babies from more than one father and that all the kittens can come out different colours! Tash: While being at the centre I’ve learnt a huge amount about the importance of the enrichment and socialisation of cats, especially kittens. For example, I’ve learnt that in order to have a well-socialised and confident cat, kittens must be socialised from two weeks old when they are most accepting of new experiences and learn quickly. What’s been your favourite experience at the Birmingham Adoption Centre and what do you like most about the Centre? Charlie: My favourite experience at the centre would be getting to sit in while the vet was doing vaccinations and blood tests, as that is what I would like to do (veterinary), or perhaps the times when I got suited into full PPE and disinfected the pens looking very scary! The thing I like most about the centre is the staff and volunteers, they make the volunteering experience 100 times better. All of the staff that work here are so lovely and are full of knowledge about anything to do with cats. It’s also nice to be around other volunteers as we’re all in it together! Tash: My favourite experience at the centre has been meeting a range of incredible cats and watching them become healthier, more loving and more confident throughout their stay, and then seeing them go off to their forever homes. Especially with nervous cats who will be allowed to thrive in their own space and be lovely companions to their new owners. Do you have any tips for future student volunteers? Charlie: A tip I’d give is always ask if you’re unsure about what you are doing, the staff and other volunteers will always be happy to tell you the right way to do things. Also, just enjoy it because you’re helping an amazing charity save hundreds of cats - be proud! Tash: Make the most of the amazing opportunities and knowledge that the Cats Protection has to offer, not only will this help you gain experience for your education or future career, but it will also allow you to make a difference with your time and help cats in need. And finally, is there anything else you’d like to say? 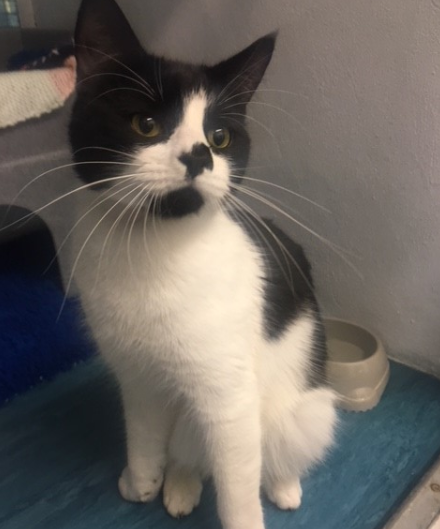 Charlie: I’d just like to say thank you so much to everyone at the Cats Protection Birmingham Adoption Centre for making me feel part of the team and to all the cats for being so lovely!